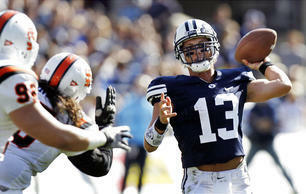 Over the past five weeks, BYU revamped its offense and won five consecutive games. But just how much have the Cougars improved during that span? That question could be answered Friday (6 p.m., MT, ESPN), when BYU squares off against TCU at Cowboys Stadium in Arlington, Tex. The Cougars (6-2), who rolled to a 56-3 victory over Idaho State last Saturday, will get an opportunity to measure their progress this season against the Horned Frogs (5-2). TCU has clobbered BYU the past three seasons by a combined score of 101-17.